Montville scored four runs in the sixth inning and went on to gain a 6-5 win over Morris Hills at the Randolph Challenge on Saturday, April 16. The one-out rally featured RBI base hits by Jaclyn Monaco, Ali Temple and Kelly Dodgson. The other run scored on an error. Monaco had a perfect day at the plate, going 3 for 3 and walking twice. Temple also had three hits, one of them a double, and knocked in a run for the Mustangs. "We've been struggling our last few games," Montville coach John Immediato said. "I've been preaching that we need to be solid one through nine in the lineup. In the sixth, we got timely hits. It was our second or third time through the order and we were beginning to make contact." Three pitchers - Kristie Monaco, Carly Paskow and Jordan Strickland - all saw action. Paskow, a senior, picked up her first career win, going 3 2/3 innings, striking out one and allowing one hit. 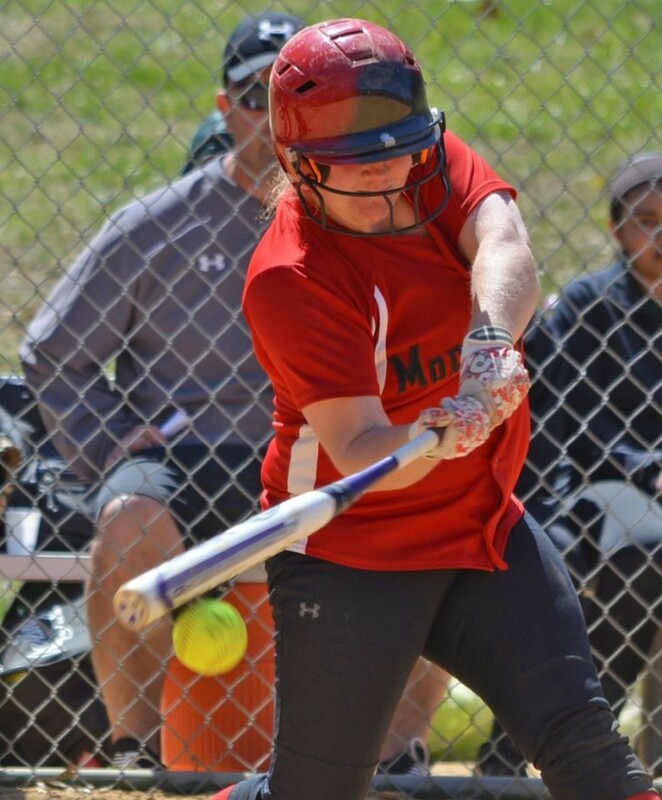 Alyssa Borozan yielded three hits and Haley LeBouef drove in two runs to highlight the Marauders' win over Pequannock at the Randolph Challenge on Saturday, April 16. LeBouef doubled to knock in two runs for Mount Olive (8-1). Gabby Grillo added a pair of singles and Annalee Smith laced an RBI single. Juliette Davis, Natalie Trautwein and Taylor Van Sant had hits for the Golden Panthers. Hannah Brizek scattered six hits and struck out six for Pequannock. The Colts, buoyed by Alexa Saccomanno's superb day at the plate, ran their record to 7-1 by going 2-0 at the Randolph Challenge. Saccomanno had four hits, including a double, and knocked in two runs. She was also the winning pitcher, going the distance and allowing eight hits. Saccomanno struck out nine and issued two walks. Sam Schwed chipped in with two hits and two RBIs for Kinnelon. Krissy Baxter led the Vikings with a home run and two RBIs. Corrine Davis had a pair of hits. Katlyn Lloyd singled and doubled and knocked in three runs for the Gaels in their second game at the Randolph Challenge on Saturday, April 16. Other top hitters were Gina Formisano (3 for 3, 3B, RBI), Natalie Decena (2 for 2, 2B, RBI) contributed to the Gaels' potent attack. Winning pitcher Emily Song was nicked for just two hits. She drove in two runs for Roxbury. Jordan Strickland paced Montville with two hits and an RBI. In the Colts' first game at the Randolph Challenge, they defeated the host Rams powered by the bats of Alexa Saccomanno (2 for 4, 3 RBIs) and Marissa Jacobia (2 for 3, RBI). Sierra Jacko notched the pitching win by scattering eight hits and posting three strikeouts. Kinnelon scored four runs in the fourth inning to snap a 3-3 deadlock. Kristen Lindquist had two RBIs and Michelle McMillan had three hits for the Rams. Madison Perna's grand slam was at the forefront of Morris Hills' win over West Morris at the Randolph Challenge. Victoria Aspiazu and Megan Gaeb had two hits and two RBIs apiece to aid the 13-hit attack. Beth Kehrley also had two hits and knocked in a run for the Scarlet Knights. Kiara Ruiz was the beneficiary of the offensive fireworks. Ruiz gave up nine hits and fanned three to gain the pitching win. West Morris received two hits from Julia McGroarty. Mount Olive, behind the hitting of Alyssa Borozan, Alyssa Segnello and Erica Manfredo, rolled past West Morris at the Randolph Challenge. Borozan had three hits, including a double, and Segnello drove in two runs. Manfredo finished with two RBIs. Rachel Jeska, who struck out four, was reached for only five hits. Maggie Heslin had two of the Wolfpack's hits.